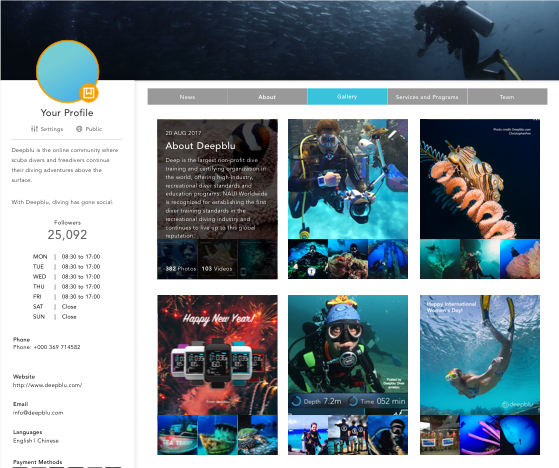 Planet_Deepblu is home to a variety of informative content that divers and ocean lovers worldwide are using to get to know more about their favorite diving sites and discover your destination as their next adventure. Our fast-paced, growing community is it also a business solution that facilitates communication between more than ~40,000 registered divers and diving-related services. Where can I find my business profile? Your business profile is always accessible form your personal Deepblu profile, as long as you have a personal account and it has been added as a team member. a) Visit Deepblu.com/planet – In order to update your profile please use your desktop version. b) Log in with your personal Deepblu account, associated with your Business profile. d) Select the business name you want to reach. Deepblu users are able visit your profile as long as it has been published. Make sure you are on the map and keep your profile up to date. If you wish to remain unpublished temporarily, go to settings and set your profile as Private. Note that new customers will be unable to find you on Deepblu.com while your profile is on private mode. 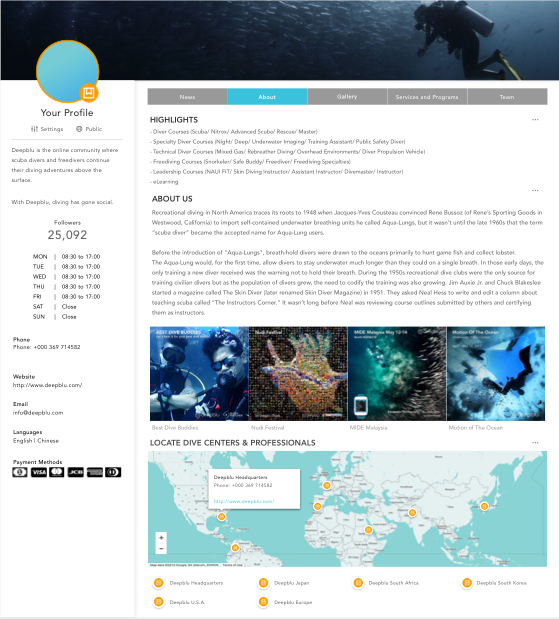 What our divers are looking for in your business profile? About: details about your business and services: features, highlights, About us, Google map. Services: a description and pictures of what you do, conditions and cost. You will find below the organization profile photo an option to edit general contact information. Only profiles granted editing rights are able to update content. Make sure yours represents the best of your business. It is recommend uploading a logo of at least 640 x 640 pixels and a cover photo of at least 1080 x 720 pixels. Address: go to google maps, locate your business and copy paste the address. The map will point to your address. Email: your main business contact. Short Description: what you do, and share your business passion. Languages: English, local language, main customers’ market language. Our divers are visiting us every day. The News section will let divers know how much your customers enjoy your services. Let your Deepblu.com followers know what’s going on at your location. Announce special events, share pictures and videos, and comment on them. Post highlights from your activities, weather, underwater pictures, or provide any other content that your followers will be interested in. 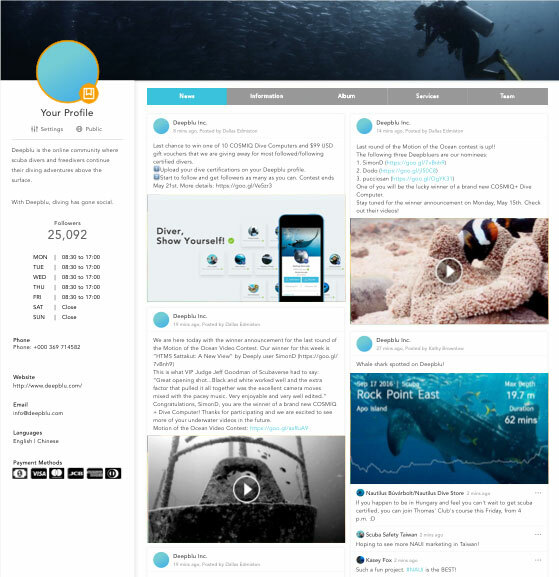 Posts will be also automatically feed to the Deepblu Live community page, giving your business more visibility to divers and getting your destination and business promoted. You can post photos and videos with hashtags, just like with any other social media or Deepblu community posts. About: go deeper into your business description. Talk about your stories, your passion and your vision. You can upload up to 4 pictures, it is recommended that they have a minimum size of 640 x 640 pixels. Location: be on the map and let everybody know where to find you. a) To edit, click on the Settings menu and click on the pencil at the top of the section. b) Go to Google Maps to find your business address. c) Locate your business, and copy paste the address exactly as per Google format. d) The map will automatically point your address. An unlimited number of photos of your business and its activities can be uploaded. Tip 2: To edit or delete an album, open the album, click on the three dots on the right-hand corner and Select editor delete. c) Add a title, a good description, and a picture (recommended size is 800×400 pixels)You may also add price range, currency, and duration the duration for each item. d) To edit or delete a service, click on the three dots on the right-hand corner and select edit or delete. Let everyone knows who is on your dream team and promote their expertise on their personal profiles. 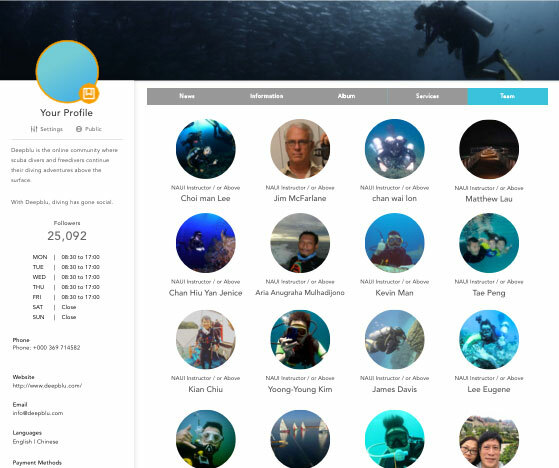 Deepblu divers will be able to discover more about your team members, consult their profiles, and add them as buddies. Who are the members of my team? Add any member of your business, they are linked to your organization and as a result will attract more visitors to your business profile. Optimizing your team members’ prestige will increase their popularity, please complete user profiles. Note that only your personal profile buddies can be added as your team members. Adding or removing team members on your organization’s profile can be done from the User Roles settings. How can I manage my team roles? Each business profile can have one or multiple user accounts associated to them. These user accounts will show up on the Team menu of profile main page. b) Find your team members and send them a buddy request. c) Wait for them to accept your invitation. d) Go to your organization profile, click on Settings, click on User Roles. e) Select Inviteon the top-left of the page (by Profile roles). f) Your buddies will automatically be displayed. g) Click on the plus icon, and an invitation will be forward to them. c) Accept the removal of this user from your business profile team. As a result, their profile photo will no longer be displayed on the team page, and granted administration rights will be removed. How can I grant my team members rights? Regular user:under this role their profiles will only be displayed on the Team page. By default, new team members will be ‘regular users’. Owner: under this role all rights and functionalities above will be granted. Note that the ‘owner’ role can be transferred to any team member.